Vocal Pluses: Powerful, passionate voice, which is grounded in the Gospel tradition. 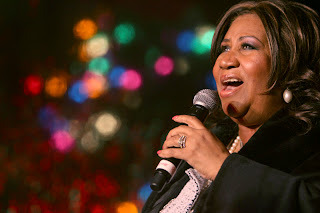 Both a technical and an emotive singer, Aretha Franklin is able to sing complex vocal runs, that can span the top of her range right down to the bottom, as well as hold notes for lengths of time with ease. Aretha Franklin has a well connected range, that appears to sound easily accessible both at the top and the bottom. The lower range is thick and weighty with a dark colouring and a slightly smoky timbre. The midrange begins to become more nasal, and lighter as it ascends into the belting range. The belting range is incredibly elastic and powerful, having been known to hit a D6 when mixed with its head voice. This part of the range is characterful and easily attributable to Aretha Franklin, due in part to its quick vibrato and nasal tone. Though her voice becomes lighter as its frequency increases, it still retains its resonance and power up into its top reaches. Her flexibility and ease in this part of the range is almost unparalleled. Vocal Negatives: The voice has become more nasal as she has aged which has lessened the power, and quality of the higher notes.